You must be a person of good moral character at the time you are filing your application for naturalization. Good Moral Character:The applicant must generally show that he or she has been a person of good moral character for the statutory period (typically five years or three years if married to a U.S. citizen or one year for Armed Forces expedite) prior to filing for naturalization. Criminal Prohibitions: The applicant is permanently barred from naturalization if he or she has ever been convicted of murder, or of an aggravated felony as defined in section 101(a) (43) of the Act on or after November 29, 1990. During the statutory period, those who indulge in habitual, heavy drinking; practice polygamy; willfully fail to support their dependents; have been confined to penal institutions; among other such acts, cannot be regarded as persons of good moral character and thus may be barred from applying for naturalization. Knowledge of the United States Government and History:All applicants for naturalization must be able to demonstrate basic knowledge and understanding of the history of the United States, and of the principles and form of government of the United States. Some applicants may be exempt from this requirement such as those who have medically proven physical or mental impairment, where the impairment affects the applicant’s ability to learn. An applicant’s ability to read, write, speak, and understand the English language, as well as knowledge of U.S. government and history will be determined at the time of the interview for Naturalization. Applicants who have been residing in the U.S. subsequent to a lawful admission for permanent residence, for at least 20 years, and are over the age of 65 are afforded special consideration in satisfying this requirement. Individuals of a certain age who have spent a certain amount of years in the U.S. also receive special consideration for example they are exempt from the language requirement. 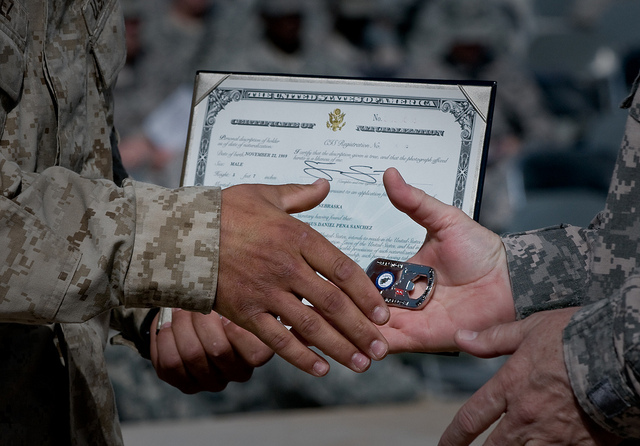 To learn more about naturalization for members of the armed forces, please contact our office. Once the application for naturalization is filed, applicants can expect the following to occur from the date the application is received from USCIS. These timeframes apply to regular filing as opposed to expedited filing for members of the armed forces. Please note that timeframes may vary according to where you live and special circumstances surrounding your case (requests for evidence, criminal convictions, etc). Once the biometrics appointment notice is received the applicant should begin to prepare for the Civics Examination which will occur at the time of the naturalization interview. Applicants may obtain study material at the ASC appointment at the time of the biometrics appointment. Study material is also found on the USCIS website. Within 5-6 months of filing, the applicant will receive their naturalization interview notice in the mail. The applicant must collect the necessary documentation and prepare for the naturalization interview. As part of the attorney fee, our office prepares clients for their naturalization interview. If the interview is conducted within San Diego county, an attorney from our office will attend the naturalization interview with the applicant. If all goes well and the applicant is approved following the naturalization interview, the applicant will receive their oath ceremony notice within 7-8 months from the date of filing of the naturalization application. The applicant will appear on the scheduled date and take the oath of allegiance. At this time the applicant will receive their Certificate of Naturalization. To learn more about naturalization please visit our website. To schedule a free consultation please contact us.